By the year 1500 the words Empire and Germany had become virtually interchangeable terms. The papacy and the Italian cities had been freed from imperial control, and both the Netherlands - that is, Holland and Belgium - and the Swiss cantons were only nominally connected. Over the Slavic people to the east - Russians, Poles, etc. - or the Scandinavians to the north, the empire had secured comparatively small influence. Beginning in 1517 with Martin Luther's posting of his 95 Theses on the door of the Wittenberg Castle church, the German-speaking territories bore the brunt of the pan-European struggles unleashed by the Reformation. 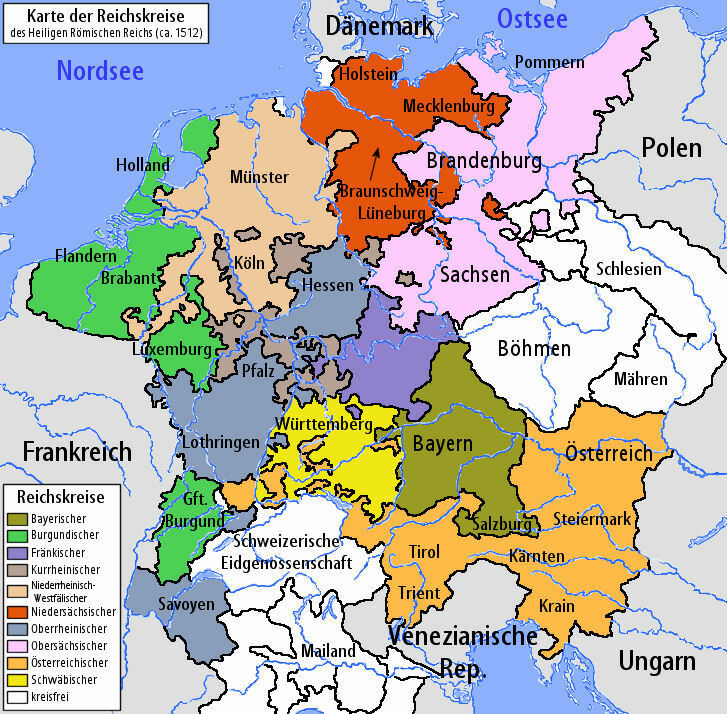 The leaders of the German kingdoms and principalities chose sides, leading to a split of the Empire into Protestant and Catholic regions, with the Protestant strongholds mostly in the North and East, the Catholic in the South and West. The split along confessional lines also laid the groundwork for the later development of the most powerful German states -- Prussia and Austria -- as the Prussian Hohenzollern line adopted Protestantism and the Hapsburgs remained Catholic. The tension culminated in the 30 Years War (1618-1648), a combination of wars within the Empire and between outside European states that were fought on German land. These wars, which ended in a rough stalemate, devastated the German people and economy, definitively strengthened the rule of the various German rulers at the cost of the (Habsburg) Emperor, though Habsburg Austria remained the dominant single German entity within the Empire, and established the continued presence of both Catholics and Protestants in German territories. 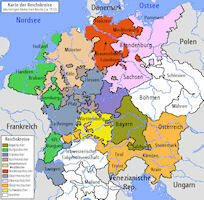 The reconstitution of Germany was finally accepted by the Diet at Ratisbon on 25 February 1803. The Holy Roman Empire which had lasted so many centuries ceased to exist. The ancient division of the Empire into circles was abolished, and the three colleges which formed the Diet were profoundly affected. Instead of the eight electors, three ecclesiastical and five lay, that formerly existed, ten electors, one ecclesiastical and nine lay, were created. The Archbishops of Cologne and Treves, whose states being on the left bank of the Rhine were absorbed into France, lost their electoral dignity. These changes remodelled Germany, and in the result were most prejudicial to France; for instead of there existing a series of buffers in the shape of small and weak states, France was brought almost directly into contact with Prussia and Austria.